Oscar-nominated documentary short Period. End of Sentence., will launch globally on Netflix on Tuesday, 12 February 2019. 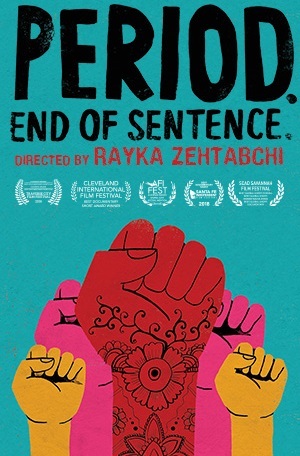 Directed by Rayka Zehtabchi, it follows a group of women and girls in rural India who work together to operate a machine installed in their village to make sanitary pads and combat the crushing stigma of menstruation. Acquired last month by Netflix, the film is produced by Zehtabchi, Los Angeles English teacher Melissa Berton, Garrett Schiff, and Lisa Taback. Period. End of Sentence. came to life at the Oakwood School in North Hollywood, California. It is the brainchild of high school English teacher Melissa Berton, and several of her former high school students, including six who serve as executive producers. They came up with the idea when they realised that many of the girls in their partner school in India would leave school and stop their education once they began to menstruate, because they did not have access to sanitary pads. Seeking to raise awareness of this issue, the students made the documentary and formed the nonprofit, The Pad Project, with the idea that a period should end a sentence, not an education. A two-pronged effort, The Pad Project works both to supply sanitary pad machines to women and girls in poverty-ridden villages around the world and shatter the stigma surrounding menstruation everywhere. Following a trip to the United Nations, where the high school students served as delegates to the Commission on the Status of Women, they started fundraising through bake sales, yoga-thons, and two successful Kickstarter campaigns in order to finance the machine and its supplies. Over the course of five years, after having graduated high school and gone off to college, the students were able to hire director Rayka Zehtabchi, a 2016 USC film school graduate and a young woman only a few years older than them, and make the film. Berton and a group of her students accompanied Zehtabchi to India to shoot it, with post being completed in Los Angeles. The documentary short double-qualified for the Academy Awards in 2018, winning jury and audience awards at Michael Moore’s Traverse City Film Festival and Cleveland International Film Festival. The film also took home jury and audience awards from AFI FEST, among other festivals, and is now nominated in the documentary short category at the ninety-first Academy Awards. ← Leaked ‘Avatar’ Sequel Titles confirmed to be real.